Here’s a look inside the Development Camp stories and takeaways of one member from each class on the 2018-2019 roster. Incoming freshman Jack Drury, pictured here at the NHL Entry Draft in June, looks to follow in the footsteps of his father, Ted, by excelling at Harvard before embarking on a solid professional career. On March 16, the Harvard men’s hockey team left the ice for the final time of the 2017-2018 campaign. Two months later, its seven seniors walked the stage, and players headed their separate ways for the summer. Make no mistake, however: the hockey never stops. 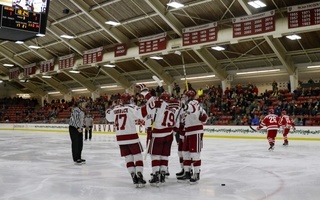 While practically every Crimson iceman is training on his own during the end-of-year recess, a select few get a taste of hockey beyond Cambridge when they skate in Development Camps for National Hockey League teams. This summer, nine members of next year’s Harvard squad adopted a novel logo across their chests—as well as new coaches, trainers, and fans—when they laced up their skates at a professional organization’s week-long camp. Five of these skaters, junior Adam Fox, sophomores Jack Badini and Reilly Walsh, and freshmen Jack Drury and Jack Rathbone, are already in the prospect pool of their respective franchises, either through the NHL Entry Draft or via trade acquisitions since then. The remaining four, co-captain Lewis Zerter-Gossage, junior Ty Pelton-Byce, sophomore Henry Bowlby, and freshman Casey Dornbach, received invites to camp as undrafted free agents. In addition to the players on the 2018-2019 team, three former Crimson standouts, forward Jake Horton ’18, goaltender Merrick Madsen ’18, and forward Tyler Moy ’17, looked to improve their chances at a professional roster spot by attending Development Camp. Regardless of what professional hockey holds for Harvard’s skaters, the Bright-Landry crowd will see the skills they have learned over the past few weeks on full display this winter. Here’s a look inside the Development Camp experiences of one member from each class on the 2018-2019 roster. As he prepares for his final Harvard season — one in which he will don the captain’s “C” for his club — Lewis Zerter-Gossage finds himself in a familiar summer routine. In short, the Montréal, Qué., native is no stranger to his local hockey camp—nor is he a stranger to NHL Development Camps, having skated in the Arizona Coyotes’ camp in 2016 before sporting his home-town colors for the Montréal Canadiens last summer. This summer, it was the Pittsburgh Penguins who approached Zerter-Gossage with an invite to camp. Luckily, the Kent School product was able to leverage his prior camp experiences to both impress the Penguins organization and get the most out of the coaching staff’s insights. 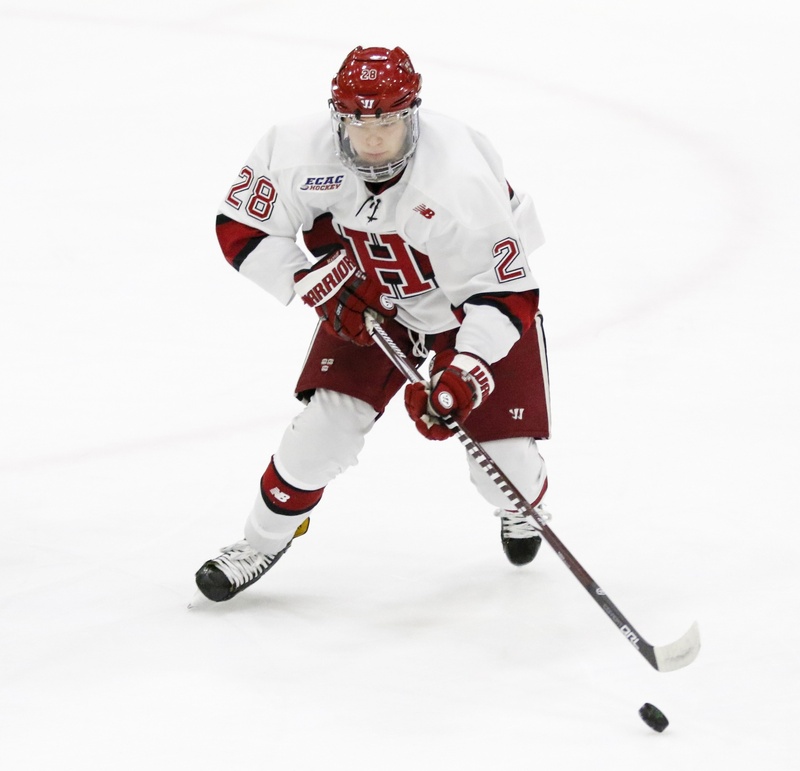 Senior Lewis Zerter-Gossage completed his third development camp this summer, this time with the Pittsburgh Penguins, and will look to incorporate what he learned about off-ice preparation and work ethic into his role as co-captain of this year's Crimson squad. For Zerter-Gossage, perhaps the most crucial takeaway from this year’s Development Camp revolved around off-ice preparation. The Penguins coaching staff stressed the importance of stretching for the sake of skating mobility and injury prevention. Turning to the game surface, the staff reinforced the Crimson co-captain’s willingness to play in front of the net and earn gritty goals, thanks to his combination of size and skill. “Hearing what [the Penguins] think about my game from their perspective is definitely something that helps me a lot with confidence and with different things that I think that I could work on,” Zerter-Gossage said. A successful week in Pittsburgh marks three camps in three summers for three different NHL franchises for the Harvard senior. With each experience, Zerter-Gossage has made strides in his game while also deepening his understanding of off-ice intangibles, which will certainly prove valuable as he co-captains this year’s Crimson squad along with forward Michael Floodstrand. Decisions about the winger’s professional future, while they may lie dormant for much of the Crimson’s 2018-2019 campaign, are likely on the horizon. One thing, though, is evident: Zerter-Gossage will continue to give his pro hockey career an honest shot. The award for most eventful summer thus far likely goes to the offensive wizard leading Harvard’s blue line. 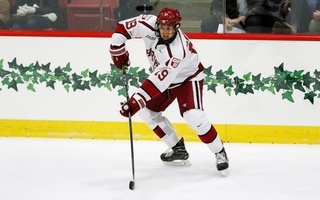 Adam Fox, a two-time reigning First Team CCM/AHCA All-America selection, saw the Calgary Flames trade his draft rights to the Carolina Hurricanes in a late-June blockbuster. Originally selected 66th overall by the Canadian franchise, the junior has blossomed into one of the most skilled players in all of college hockey and certainly one of the Crimson’s most exciting NHL prospects. So even though the Jericho, N.Y., native skated in his third Development Camp this summer, his experience was full of firsts as he got to know his new organization. Junior Adam Fox, who will once again command the Harvard blue line in 2018-2019 with his offensive prowess, saw his rights traded in June from Calgary to Carolina. One new face at the Hurricanes’ camp was incoming Harvard freshman Jack Drury, whom Carolina selected 42nd overall in this year’s Entry Draft. Fox and Drury actually roomed together during Development Camp, a source of comfort in an otherwise new environment for both of them. As a highly-touted prospect who has multiple college seasons remaining, Fox will have a crucial decision to make at the end of Harvard’s 2018-2019 campaign. He can depart college early and get a jumpstart on his NHL career à la Ryan Donato last season. 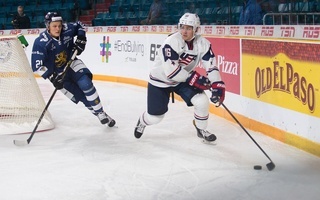 Alternatively, he can follow the footsteps of recent stars Jimmy Vesey ’16 and Alexander Kerfoot ’17 and return for his senior year, likely captain a talented Crimson squad, and have the option of entering the NHL as an Unrestricted Free Agent, providing him some leverage in choosing his dollar value and destination. Henry Bowlby spent much of last summer in Cambridge, where he studied and trained in preparation for his freshman year. And while a summer in Harvard Square has its perks, the rising sophomore does admit that it is nice being home in Edina, Minn., this year for individual training and interning. Bowlby couldn’t stay away from Beantown altogether, though. 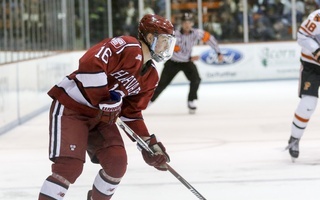 In late-June, he joined the Boston Bruins’ Development Camp as an undrafted free agent invite. Aside from the rigorous skating test, Bowlby noted that the vibe at the Bruins’ Development Camp was relatively laid-back and that the skills-based training was quite intensive. He also recognized how Development Camp may have helped the games of some of Harvard’s most talented players in recent years, such as Fox and Donato. In fact, Donato, an alumnus of the Bruins’ camp, reached out to Bowlby ahead of time to offer advice. 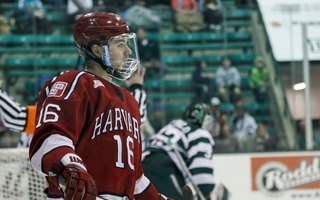 While at camp, Bowlby had a friendly run-in with Donato and former Harvard rearguard Wiley Sherman ’18, both members of the Boston organization who were training at the practice facility. 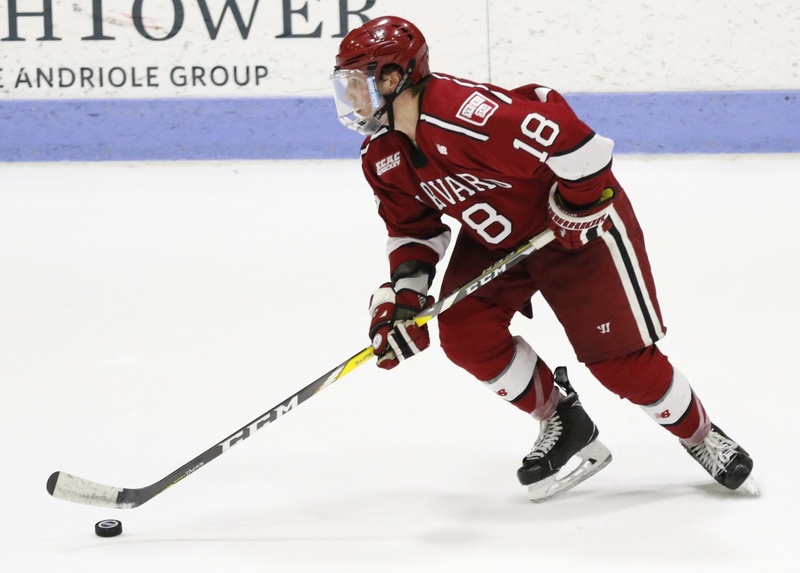 Sophomore Henry Bowlby received an undrafted free agent invite to the Boston Bruins' Development Camp despite missing a substantial chunk of games last season due to illness. Even with the absence, he managed to impress the Bruins organization enough to receive the call. Another friendly face for Bowlby at Development Camp was former Harvard Associate Head Coach, Paul Pearl, who recently moved across the river to join the Boston University staff in the same role. The Bruins organization utilizes local coaches like Pearl to provide extra insight for the players at camp. Compared to Zerter-Gossage and Fox, the sophomore forward certainly has more time to decide on his future hockey plans. His experience at Development Camp this summer, though, has gotten the wheels turning. “I haven’t really been thinking too much about a pro career, but obviously after the Bruins’ camp and seeing that they were interested, it was really exciting for me,” Bowlby said. The most recent NHL draft pick among his Harvard teammates, Jack Drury headlines a talented class of eight freshmen who will be tasked with filling the void left by last season’s departures. Hockey is in Drury’s blood: his father, Ted, skated in over 400 NHL games after an illustrious career with Harvard in the 1990s, while his uncle, Chris, captained multiple NHL teams and won a Stanley Cup with the Colorado Avalanche in 2001. Despite the impressive pedigree, Drury will have to pave his own way to the NHL. So far, the Winnetka, Ill., native is on the right track, having been selected in the second round by the Carolina Hurricanes in this year’s NHL Entry Draft before attending his first Development Camp mere days later. Not only were the events of late-June enjoyable for Drury, but they were also productive. 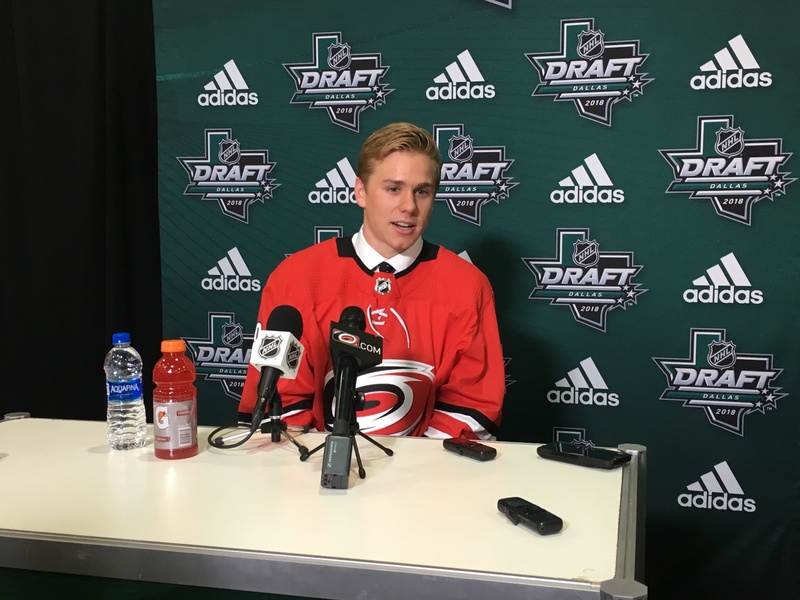 At ‘Canes Development Camp, the former USHL standout added layers to his game that will prove effective at the college level, especially in the physical ECAC. According to Drury, the disciplined and hard-working culture of his fellow NHL-hopefuls at Development Camp was contagious. Over the course of the summer, the forward has been in touch with members of his Harvard class. But having the chance to room and skate with one of the leaders on next year’s squad, Adam Fox, was especially rewarding for him. Fox himself was impressed with his new teammate. 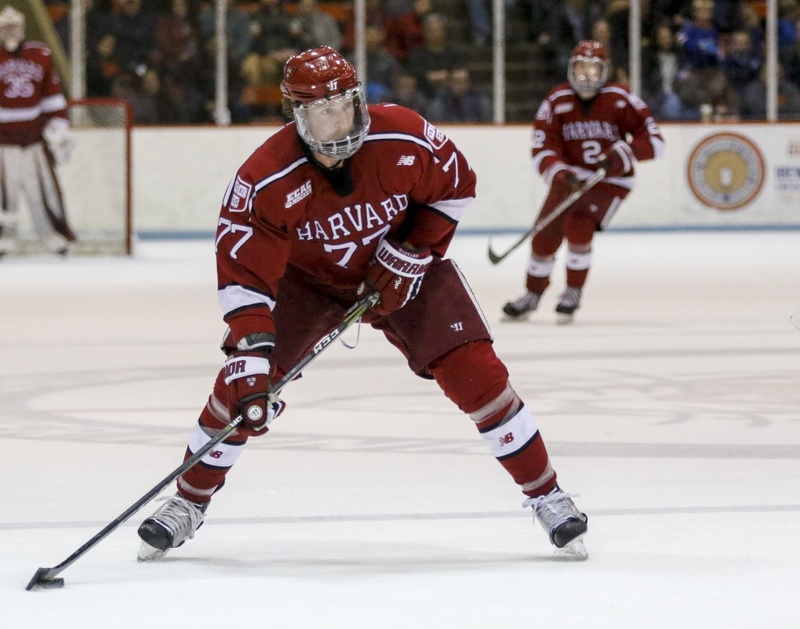 While Development Camp ultimately suggests a hockey career beyond Cambridge, the skills and habits that the nine Crimson skaters gleaned at Development Camp this summer will serve the Harvard team well in the 2018-2019 season and beyond.